The Toledo Rockets football team is a college football program in Division I FBS, representing the University of Toledo. The Rockets compete in the Mid-American Conference. Toledo began playing football in 1917, although it did not field teams in 1931, and 1943–1945. Since the inception of the AP Poll in 1936 Toledo has finished in the Top 25 four times. Its highest finish came in 1970 when it ranked #12 after finishing 12–0–0. The University of Toledo has a 10–7 record in bowl games. The Rockets were the 2017 MAC champions. The team's current head coach is Jason Candle. Toledo first fielded a football team in 1917, under the leadership of John Brandeberry. According to Toledo Rockets lore, the team began when a group of students purchased uniforms from a sporting goods store, then arranged a game against the University of Detroit in order to settle the debt. Brandeberry stepped in to coach the team, which promptly lost the game 145–0 (but settled the debt). For the first few years Toledo played without a nickname, but was dubbed the "Rockets" after two long touchdown runs in a 1923 loss to Carnegie Tech. That season also saw Toledo win its first conference title. Clarence Spears served as the Rocket's head coach and athletics director for seven seasons, from 1936–1942. Under his tutelage, the Rockets compiled a record of 38–26–2. which included five consecutive winning seasons. 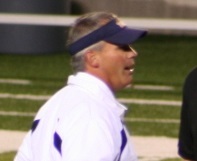 In two seasons, the Rockets compiled a record of 11–10 under head coach Skip Stahley. Forrest England served as Toledo's head coach for two seasons in 1954 and 1955, compiling a record of 9–7–2. In April 1930, Toledo hired Jim Nicholson to become the Rockets first full-time football coach. With his upgraded schedule and organized recruiting, Nicholson helped build UT's team into a powerful and respected program. In his final season, the Rockets finished 6–2–1, including a 63–0 win over rival team Bowling Green. The huge win led to a 13 year break in the rivalry between the two schools. Nicholson help design the Glass Bowl stadium, and continued to be involved in the school's athletics following his retirement by reorganizing the Varsity 'T' Club. He finished his career as the Rocket's head coach with a 20-16-4 record. Clarence Spears continued to help the UT football program grow following Nicholson, with 38 career victories that stood as a UT record for 30 years before being surpassed by Frank Lauterbur’s mark of 48 wins. In 1942 when UT's football program was suspended due to WWII, Spears left to take the head coaching job at Maryland. His overall record as head coach for the Rockets was 38–26–2. Although head coach for the Rockets for just two seasons, Bill Orwig established one of the best winning percentages in the program's history (.762). He is one of few coaches in UT to coach two sports at once, overseeing both the football and basketball teams. His overall record as football coach was 15–4–2. Affectionately known at "FXL" by his team, Frank Lauterbur coached the Rockets during one of the most successful eras of the program's history. Under his leadership, Toledo won three MAC titles including the first in the school history in 1967, and won both of their two consecutive Tangerine Bowl appearances. The team's 35 consecutive game wins during Lauterbur's era currently ranks fifth in the longest winning streaks in NCAA Division I football. Charles "Chuck" Ealey led the Rockets to all 35 victories as starting quarterback. In 1970, the Rockets finished the season ranked 12th in the AP poll and 17th in the UPI poll. After capping that season with a second Tangerine Bowl victory, Lauterbur took a head coaching job at Iowa. His overall 48–32–2 record at UT includes two perfect seasons in 1969 and 1970. Jack Murphy, an assistant under Frank Lauterbur and coach of NCAA Division III Heidelberg, took over as head coach for the Rockets in 1971. In his first season, he led the Rockets to an undefeated 12–0 record, a MAC Championship title, a third consecutive Tangerine Bowl win, and a 14th ranking in the year's final AP poll. That was also the year Toledo’s famed winning streak reached 35 games, a streak begun under former coach Lauterbur. Murphy led the Rockets to a 35-32 record before his departure in 1976. Chuck Stobart held the head coaching position for five seasons, rebuilding the Rockets into a stronger program and premier MAC conference contender. He earned MAC "Coach of the Year" honors in 1979 and 1981. In 1981, he led UT to a 9–3 record, a MAC Championship title, and a memorable 27–25 victory over San Jose State in the California Bowl that was decided on a last-second field goal by Tony Lee. Stobart left UT to become the head coach at Utah in 1981, departing with an overall 24–31–1 record with the Rockets. Dan Simrell took over the UT football program after Stobart's departure, going on to coach through eight seasons with a total of 50 victories, the third-most wins of any coach in the program's history. In 1984 with a 9–2–1 record, he led UT to a Mid-American Conference title and a California Bowl appearance. A native of Toledo, Simrell was the first UT alum to coach the football team. He lettered as a quarterback from 1962–1964 and served as an assistant coach from 1971-1981. Overall, Simrell posted four winning seasons of his total eight as head coach, with an overall 50–37–2 record. He resigned following the 1989 season. Nick Saban was head coach of the Rockets for one season, leading Toledo to a 9–2 record and a MAC co-championship in 1990. The two games the Rockets lost that season were by narrow margins: one point to Central Michigan, and four points to Navy. While at the helm of the Rockets, Saban turned down an application of Urban Meyer, who was looking for a job on his staff as an assistant coach. Saban left Toledo after the 1991 season to become the NFL's Cleveland Browns defensive coordinator under Bill Belicheck, and later head coaching positions at Michigan State (1995–1999), LSU (2000–2004), the NFL's Miami Dolphins (2005–2006) and Alabama. Gary Pinkel came to Toledo from his post as offensive coordinator at Washington. With an overall record of 73–37–3, he has the most wins in UT history. He also has the second best winning percentage (.659) among UT coaches who led the program for at least four years. Pinkel led the 1995 Rockets to an 11–0–1 record, a Las Vegas Bowl victory, and end of season rankings in the Top 25 of both the AP poll and Coaches poll. In 1997, Pinkel's Rockets took the first-ever MAC West title and appeared in the MAC Championship game. The Rockets finished the season 9���3, with a mid-season ranking high of 18 in the AP poll. They repeated at MAC West champions in the following 1998 season. In Pinkel's final season in 2000, the Rockets went 10-1, including a 24-6 victory over the Penn State Nittany Lions and a 25th place ranking in the final regular season polls. Following that season, Pinkel took a head coaching position at Missouri. He's been inducted into three college football hall of fames: Toledo, Kent State (his alma mater), and the Mid-American Conference. Known as "Toledo Tom", Tom Amstutz led the Rockets to some of the greatest successes, including two MAC Championships, four MAC West titles, and four bowl game appearances. A native of Toledo and former Rocket player himself, was promoted from defensive coordinator, a post he held under Saban and Pinkel, to the Rockets head coach after Pinkel's departure. During his eight seasons as head coach, Amstutz led the Rockets to impressive victories over #9 Pittsburgh, Minnesota, Kansas, and Iowa State. Perhaps the greatest though was a 13-10 defeat in 2008 against the Michigan Wolverines in Ann Arbor. The Rockets are the first and only MAC football team to beat Michigan. Amstutz resigned as head coach following the 2008 season. His final record as head coach was 58–41, including victories at the 2001 Motor City Bowl and 2005 GMAC Bowl. In December 2008, Toledo hired Oklahoma State defensive coordinator Tim Beckman as the new head coach for the Rockets. He revived the football program, leading the team through consecutive winning seasons with two bowl appearances and one MAC West Division co-championship. In 2011, the team earned an appearance in the Military Bowl. Beckman resigned at the end of the regular season before the bowl game to take on a head coaching position at the University of Illinois. His record at Toledo is 21–16. Named interim head coach following Tim Beckman's departure for Illinois, Matt Campbell made his debut as the Rockets coach with a 42-41 victory over Air Force in the 2011 Military Bowl. At 32 years old, he was the youngest FBS coach at the time, and went on to enjoy four winning seasons and an overall record of 35-15. The team saw big victories along the way with a win over #18 Cincinnati in 2012 and a 2015 upset of #18 Arkansas in Little Rock, Toledo's first win over an SEC team. They also went on to a bowl victory over Arkansas State in the 2015 GoDaddy Bowl. Campbell resigned as head coach at the end of the 2015 regular season to accept a head coaching job at Iowa State. Initially planning to following Matt Campbell to Iowa State for an assistant coaching position, Jason Candle changed course and quickly returned to Toledo after the Rockets offered him the head coaching position. Like his predecessor, his first game as head coach was a bowl victory, with the Rockets defeating #24 Temple in the 2015 Boca Raton Bowl. In 2017, the Rockets defeated Western Michigan to become the outright MAC West Division champions for the first time since 1998, and their first trip to the MAC Championship since 2004. Toledo went on to defeat Akron 45-28 and win its first MAC Championship in 13 years. The Rockets have won 11 division titles. Toledo has appeared in 18 NCAA-sanctioned post-season bowl games since 1969, and has a 10–8 record overall. From 1946 through 1949, the Rockets played a post-season game named the Glass Bowl that was played at their stadium. They were 3–1, losing the last game to the Cincinnati Bearcats. Like some other postseason match-ups of the era, such as the Grape Bowl and the Optimist Bowl, results are listed in NCAA records, but the games were not considered NCAA-sanctioned bowls. ^* After the 1984 California Bowl, it was found that UNLV had allegedly used ineligible players during the season. Despite the fact that they were not used in the bowl game, the school forfeited the win, though the NCAA does not recognize the forfeit. Swayne Field (1942) UT played five of six home games at Swayne Field in an effort to conserve fuel for the war effort. Fetterman Training Center (2010–present) Indoor multi-use athletics facility, including a 100-yard Field Turf playing surface. Larimer Athletic Complex (1991–present) Locker rooms, meeting rooms, weight rooms, and offices for Rocket football and athletic department. Toledo and Bowling Green have a rivalry, nicknamed "The Battle of I-75", dating back to 1924, when BGSU challenged the participation of Toledo's captain, Gilbert Stick, after it was discovered that Stick also played for a local team in Genoa, Ohio. Conference rules did not prohibit such play, and BGSU's protest was overruled. In 1950, Toledo's athletic director charged BGSU students a higher price for tickets at a basketball game than the general public, while rumors spread of a dog-napping attempt by BGSU against Toledo's mascot. Another incident came in 1951, when a fight broke out after a hard hit by a BGSU player on fullback Mel Triplett. Don Greenwood, then Toledo's coach, participated, and resigned after the university failed to back him up. In Greenwood's view, the officials should have called a penalty for excessive roughness, and he had a duty to protect his players. Four players in the history of the University of Toledo have had their jersey numbers retired. ^ University of Toledo Logo Sheet (PDF). Retrieved August 2, 2017. ^ a b c d Rothman, Seymour (November 10, 1991). "An intimate, informal, and irreverent look at the early days of UT football". Toledo Blade. Retrieved 2010-01-10. ^ "University of Toledo Athletics - Dr. Clarence Spears, Football Coach (1936-1942)". www.utrockets.com. ^ "J. NEIL (SKIP) STAHLEY, 83, UI ATHLETIC DIRECTOR". ^ a b c d e f g h i j k "2017 Toledo Football Media Guide" (PDF). Retrieved January 1, 2018. ^ Thamel, Pete (4 December 2009). "Nick Saban and Urban Meyer Share a Friendship With Bill Belichick" – via www.nytimes.com. ^ Lena, Sebastian. "Nick Saban Says 4 Years Under Bill Belichick Were 'Worst of My Life'". ^ "1991 flashback: Win over Gary Pinkel's Toledo a milestone". 5 October 2011. ^ "COLLEGE FOOTBALL; Penn State Is No Match for Toledo". Associated Press. 3 September 2000 – via www.nytimes.com. ^ "UT hires 2 coaches". 10 January 2001. ^ "Toledo beats Michigan 13-10 after late FG miss – USATODAY.com". usatoday30.usatoday.com. ^ "Tom Amstutz Will Step Down as Head Football Coach at End of This Season; Accepts New Position in UT Alumni Office". University of Toledo. ^ "Toledo hires Oklahoma State defensive coordinator Beckman as coach". Associated Press. December 4, 2008. ^ "2011 Military Bowl". MILITARY BOWL PRESENTED BY NORTHROP GRUMMAN. Retrieved 2018-01-02. ^ "Arkansas vs. Toledo: What we learned from the Rockets' 16-12 win over the Razorbacks". ^ "Matt Campbell named Iowa State's head coach". ^ "Toledo promotes Candle to HC, players celebrate". SBNation.com. Retrieved 2018-01-02. ^ "Toledo beats No. 24 Temple in Boca Raton Bowl". USA TODAY. Retrieved 2018-01-02. ^ "Toledo tops Western Michigan, earns spot in MAC title game". The Blade. 2017-11-24. Retrieved 2018-01-02. ^ "Toledo routs Akron for first MAC title since 2004". The Blade. 2017-12-02. Retrieved 2018-01-02. ^ a b "2017 Media Guide" (PDF). utrockets.com. Toledo Athletics. ^ "Toledo In the Polls". College Football Data Warehouse. Archived from the original on 2010-02-16. Retrieved 2010-01-10. ^ "Toledo Composite Championship Listing". College Football Data Warehouse. Archived from the original on 2010-02-16. Retrieved 2010-01-10. ^ "BOWL/ALL STAR GAME RECORDS" (PDF). NCAA. Retrieved January 7, 2017. ^ Rothman, Seymour (February 19, 1950). "TU-Bowling Green Rivalry Overheating Rapidly". Toledo Blade. Archived from the original on July 12, 2012. Retrieved 2010-01-10. ^ "Toledo and San Diego State to Play Football Series Beginning in 2020". utrockets.com. Retrieved October 3, 2017.